Best Rated Recumbent Ellipticals * Comparison & Reviews 2018-2019: This is a roundup, comparison and reviews of the best rated seated recumbent elliptical trainers. A recumbent elliptical allows you to train in a seated position, making it easier on your back, and easier to mount. People with disabilities or mobility problems prefer the recumbent type of elliptical. You will see the higher end models in rehab facilities. Those with arms are called cross trainers, as they can build your upper body as well. Recumbent Elliptical Cross Trainers provide an excellent form of aerobic exercise at home that you can do no matter what the weather is outside. Elliptical machines are easier on your joints than other forms of cardio exercise. These low-impact exercise machines also build arm and leg strength. You can compare each elliptical trainer below by features such as workout programs, reviews, maximum weight capacity, price, and other features. A glossary of terms is available at the bottom of this page. Maximum User Weight: 330 lbs. 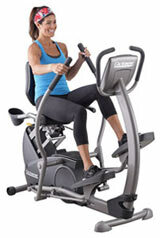 Recumbent (Seated) Elliptical = These type of ellipticals have back support, as you exercise in a seated position. These type of ellipticals are commonly used in rehab, as they are easy to get into, and better on joints. Maximum User Weight = Each recumbent elliptical trainer depending on its construction has a maximum user weight limit. More expensive trainers generally can handle more weight. So if the limit is 300 lbs, and you are over 300 lbs., you should not buy this trainer but look for one with a higher weight limit. If you weigh substantially less than the weight limit, this will put less strain on the machine and parts. Magnetic Brake Resistance = Most recumbent Elliptical Machines use magnetic resistance which offers resistance through magnetic fields. One type of magnetic resistance is ECB (described below). Magnetic resistance is more maintainance free than those older technologies that relied on friction pads and belts. Magnetic resistance braking is smoother to use is quieter than other types of resistance mechanisms. ECB Resistance = ECB Resistance is a high quality form of magnetic brake resistance. ECB = eddy current brake. This is the best type of resistance and is in most recumbent ellipticals. Heart Monitor = Most elliptical trainers have a heart monitor (grip or clip on type) which allows you to monitor your heart rate to meet heart rate goals for cardiovascular fitness. Grip monitors are built into the handlebars. The heart rate can be gotten by either a grip pulse monitor, or chest monitor. Most ellipticals have at least the grip monitor, and some have both a grip and a chest monitor. Polar Compatible = A polar wireless telemetry belt can be used for your heart rate. Telemetry Belt/Telemetric Transmitter = This is a belt that is worn to wirelessly monitor your heartrate. This can be used instead of the grip type of heart monitor and is considered more accurate. Swivel Seat = A seated elliptical with a Swivel Seat allows you to get on the bike easier, as it turns so you can get on the elliptical from the side and then turns to the front. Great for those with limited mobility. Cross Trainer = Most recumbent ellipticals will give a cross training workout (legs and arms), as the handlebars move as well as the pedals. Stride Length = This is the distance between your front foot and back foot at full extension on an elliptical trainer. LED/LCD Display = The recumbent elliptical trainer will have a display to give you information (such as time, calorie burn, distance). They can be either LED lit, or use an LCD screen. Many ellipticals have LCD screens that are not backlit, as many run on batteries. If its says “BACKLIT LCD”, then it has a backlight illuminating the screen. LED displays are illuminated screens.